Standard - $2.99 Only 7 left! There are signs all over the place warning us of bad things that could happen to us if we touch something, or trespass on certain territory. Some of those signs definitely look very foreboding. One example of this is the cursed forests that dot the world. We usually try to get the scariest, most decrepit signs that we can find in order to deter people from going in there, because typically that's how scary things happen. Nobody wants to find another video of a bunch of out-of-focus campers getting chased through the dark until they disappear. 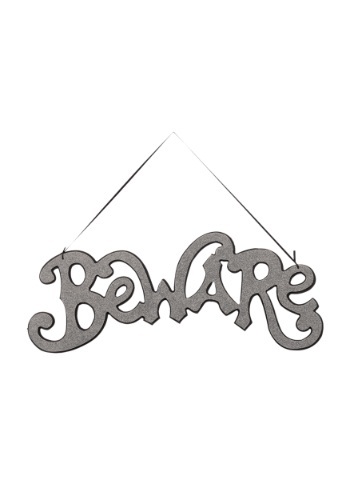 In other instances, like when we're showing off some light-hearted scares at a Halloween party, we will use a much sweeter sign to match the other decorations like this fun lettering. It is much more of a warning that you might never want to leave the fun rather than a sign that indicates you'll probably never escape this forest. Things are just simpler that way.